Tag Archive | "old trafford"
So many people, and so many of them young. The market is every bit as crowded today, but the age mix is quite different. 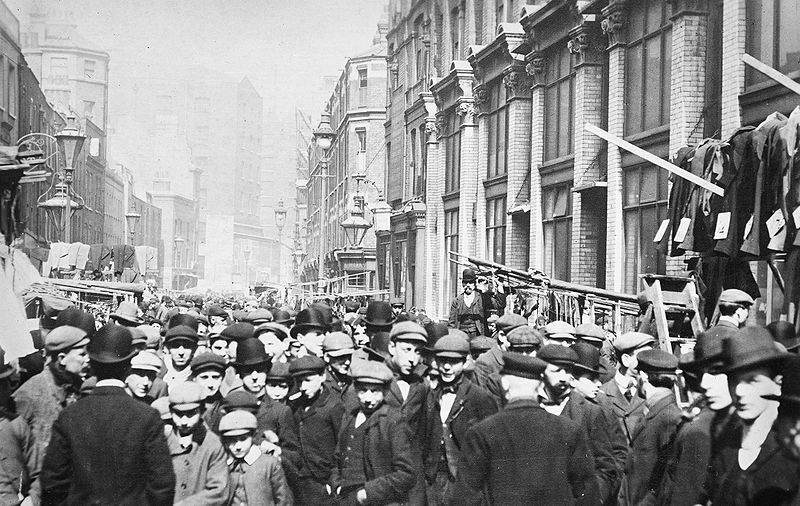 In 1903, Petticoat Lane was no longer towards London’s eastern edge. Beyond it now lay mile upon mile of Victorian brick terraces, still new: Bow, Silvertown, East and West Ham, Hackney, and, further north, Stoke Newington and Tottenham. A new city as large as the old one had been built in little over 30 years. That new city contained many of London’s football clubs, and the clubs’ presence there tells us a lot about the game, about urban and population growth and about just how a new area came to find its identity. Identity is a problem, when you’re cheek by jowl by a city built by the Romans. Identity is a problem when your area looks exactly the same as every other new area that has appeared on the outskirts of old cities. A new professional football club needs two things: space in which to build, and a sizeable, rapidly growing audience within easy reach of it. Those two factors were present together in an economically viable way in the north before London and the south. The north had spare land, yet a densely-packed and rapidly growing population in areas that lacked the diversions and entertainments that established settlements could turn to. And it had expertise. The football stadiuim was a new form of architecture. Northern urban industry was posing all kinds of new challenges to building and architectural firms, and the ideas that arose to solve those challenges also proved relevant when it came to Goodison Park, St James’ Park and Old Trafford. 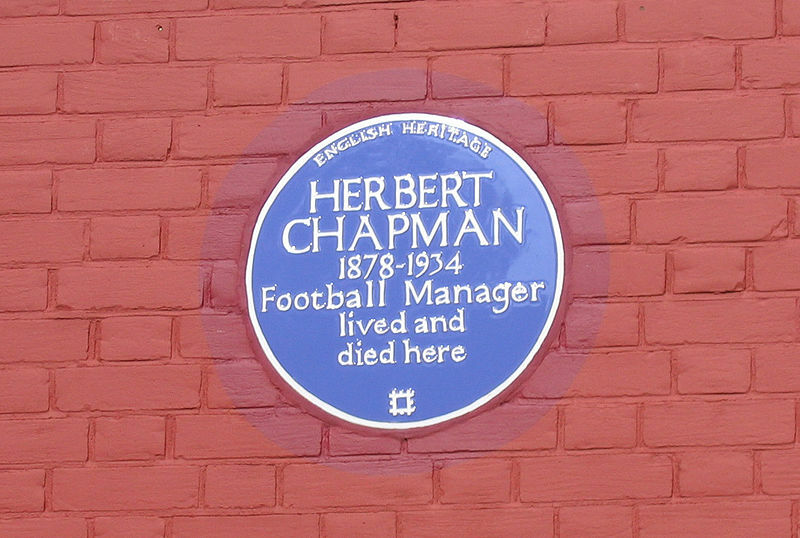 At the end of the nineteenth century, before the rise of cinema, there was a period of opportunity in which a football ground would offer the principle form of mass entertainment in an area. No theatre could hold as many people as Old Trafford – with a football stadium, you could surround your stage on all sides with revenue-earning audience space. Most of a football ground was made up of standing terraces, too, so you could pack as many people in as you were able. The football stadium was a weapon in a sporting arms race. Businessmen had to wield it before their local rivals. Local businessmen bought up the clubs that the churches and factories had founded, built huge grounds for them, and fought tooth and nail to get their clubs into the best possible league structure available to them as quickly as cash and corruption could carry them. Time was short – no one knew how long the football craze would last. The great British stadia went up in a fifteen year frenzy between 1895 (Goodison) and 1910 (Old Trafford). That surge of construction ceased with the end of dense urban population surge. After World War One, the cities would go into middle-aged spread: suburban semis and flats now, not terraces. Football’s youth and moment of opportunity had passed. There are two aspects to nineteenth century urban population growth that show why football, although no longer in its astonishing phase of growth, survived and persisted after World War One. They show how a craze could become a national institution, a sport as intrinsically British as cricket or steeplechasing. The first is the astonishing growth in the British population across the last two thirds of the nineteenth century. The famous pre-industrial cities of Britain – Edinburgh, Bristol, Norwich, Glasgow,Bath, London, Cambridge, Oxford, Salisbury, St Andrews, Aberdeen, Chester etc. – were established in a recognisable form with still-familiar street patterns before the Reformation. They were the population centres of a pre-industrial Britain whose population swung up and down between two millon (1377) and six million (1342 and 1750). By comparison, about 1.5 million people attend league matches alone at Old Trafford each season. By 1850, the population had surged to 16 million. By 1901, with Goodison Park up and running, it had almost doubled again, reaching 30.5 million. What is the psychological impact upon a United Kingdom when, within the space of less than a lifetime, there are twice as many people walking the streets? Of course, there was epic overcrowding, especially in Glasgow, which would remain the world’s most densely populated city until World War II. And there was housebuilding on a huge scale, although never enough to cope. There were, in any case, no working definitions of what “coping” would look like. But what did it feel like? There’s surprisingly little proper work on this. John Carey’s The Intellectuals and the Masses does at least recognize that there might have been a psychological impact, but he’s content to use it as a means to humiliate the Bloomsburys by highlighting their elitist, eugenicist impulses. Wealthy, upper middle class authors, Carey says, dreamed, not of electric sheep, but of enlightened mass murder and the promotion of high culture over the right to life of the low born. At any rate, football, and not Bloomsbury, is directly relevant to how Britain actually did cope with its swarming population. In 1848, when football pioneers Arthur Kinnaird and Quintin Hogg were in curls, the prospect of a crowd of 100,000 gathering in London inspired a kind of controlled panic in government. As Kennington Common filled with radicals and proto-socialists, London filled with soldiers. Special constables were hurriedly recruited. Snipers crowded the rooftops. By the time Kinnaird was 54, the FA Cup Final at Crystal Palace between Sheffield United and Tottenham Hotspur could attract an estimated 115,000 people. A small number of unarmed bobbies came along to enjoy the sunshine and ice cream. This was progress. Football was helping bed in the idea that the British could assemble peacefully in large numbers without riot or disturbance. A doubling of the population would cause disgust to Virginia Woolf and have her friends dreaming of class genocide. But Bloomsbury had missed the point. What was Crystal Palace 1901 all about, if it wasn’t the back of the newspaper coming to the rescue of the front? Football, then, helped Britain process terrifying population growth, and demonstrated to government that, although there were twice as many people as before, those “masses” were capable of governing their lives in ways that were as civilized as any law and order obsessive could have desired. That’s not to say that there was no crowd disorder around professional football, or that professional football was respectable. There was plenty, and it wasn’t. But population growth didn’t mean crime and breakdown: it meant busy turnstiles and a brisk sale for the post-match pink ‘un. A population that was twice the size of 1850’s didn’t fit into the old towns and cities. Even with increasing population density, 30 million Britons meant, in essence, that a new Britain, with its own new centres of population, had sprung into existence. I’ve already asked about the psychological consequences of population growth. Now I’d like to add another question. What is the psychological experience of living in a new place, with everyone an “incomer”? If you run a list of pre-reformation towns and cities through your mind, images and symbols for each come immediately. Wells Cathedral, Salisbury Cathedral, The Tower of London, Oxford’s dreaming spires, Bath’s Roman remains. Now think of Gateshead, Middlesbrough, or Salford. At the time of the football craze, these Coronation Street towns and cities were as new as Milton Keynes is now. They were home to many thousands of people. Only some of those people had come in from the depressed agricultural fields of Britain looking for work. By 1900, a large proportion of them were young children born to “incomers” living in new and – in truth – unlovely places. There is a rootlessness to this existence that you can actually feel. What would create place loyalty in those circumstances? Writing of her upbringing on a 1960s council estate, Lynsey Hanley said that there were times when she longed to have come from “somewhere.” Her estate wasn’t a place in as strong a way as a Hampstead or an Edinburgh New Town was. Was it like this for the people of Victorian Gateshead or Middlesbrough? Rather than ask where people in such places could find a sense of place or group identity for themselves, we can simply observe what happened. Liverpool’s docks are a World Heritage Site, but if Liverpool were to catch fire, most people would choose to throw Anfield and Goodison into the overnight bag instead before making their escape. (And if there’s room, the Cavern Club..)The most famous building in Manchester is a football stadium. The same can be said for Birmingham. And Stoke. And Glasgow. And Bolton, and Preston, and Leeds. When the football craze was first underway, no one anticipated that clubs would become the focus or external identity for the new and history-deficient incomers areas in which they were built. By the time Manchester United changed their name from Newton Heath, there was an inkling of what was afoot. But even then, no one knew how long football would last: the surviving literature of the time is too astonished by what had already happened to dare to look into a crystal ball. Loyalty to your home town is easy if your home town is Ludlow or Tewkesbury. In Salford, in Gateshead, when they were new, and you were only there for work or by accident of birth, less so. Football helped. The surroundings might have been ugly, but your neighbours were honest, hardworking people, and your team carried that good news out to the rest of the world every time they played away from home. These days, London is surrounded by new growth areas that appeared after the football craze had burnt itself out. Bromley, Croydon, Sutton, Morden, Norbiton, Beckenham, and Penge are home to cumulative hundreds of thousands of people. There are no famous buildings that symbolize these places for outsiders yet, and very little well-known history. All of them are on the sites of ancient settlements, but in real terms, each of them is new, like Lindsey Hanley’s estate. What will happen there is yet to happen. Like Gateshead and Middlesbrough when those places were young, they have economic existences, not spiritual or historical ones. These things come in time. Football helped the new ninetenth century Britain, with its 15 million new people, coalesce and find a sense of place and belonging. But walk around Sutton or Morden today, and although you’ll see plenty of Chelsea FC car stickers, it isn’t the same. In travelling time, Sutton is further from Stamford Bridge than Edinburgh is from Glasgow. Loyalty to Chelsea, in Sutton, is a loyalty borrowed from pre-War ancestors who lived in Sands End and Fulham and moved away. Football gave Sands End a name and feel: the memory of that happening in 1905 can’t do the same to suburbs in south London in 2010. Nor can the Conference and Ryman League clubs of Sutton and Carshalton. 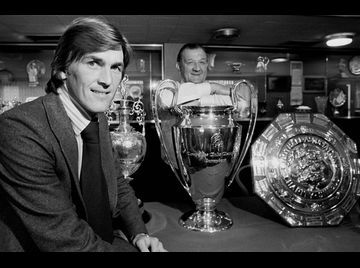 What football did for Middlesbrough, it will probably never do again.